Ah... The iconic Christmas red. You illusive beast you! 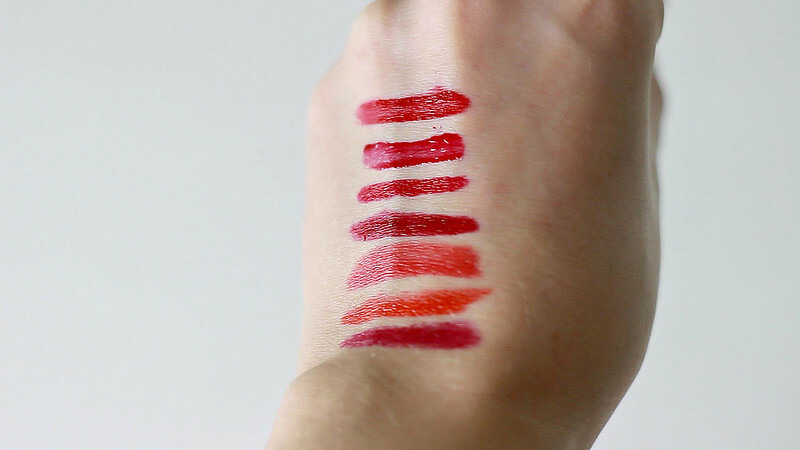 I've spent many a Saturday afternoon running around Superdrug or Boots, swatching every single red lipstick they have in stock before leaving, back of hands tattooed and faith in all lipstick humanity gone. 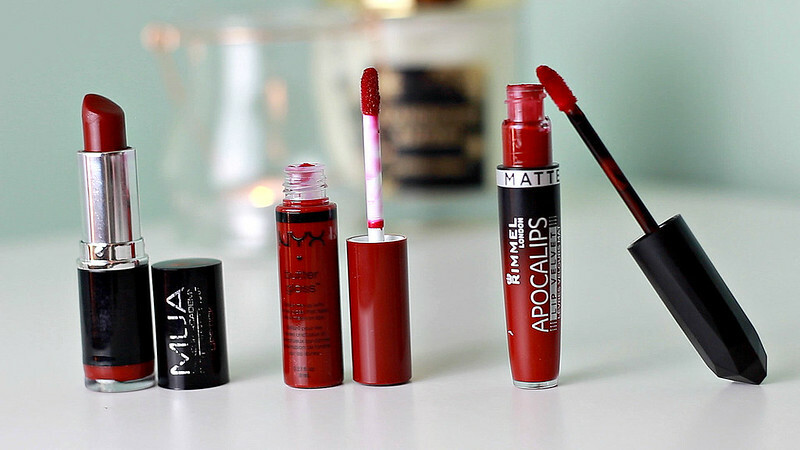 So while the search for the perfect "Marylin" red continues, I wanted to show you a few of my favourite stand in shades that have been making their festive debut over the last few weeks. First up I have what I call my "Dark Reds". An incredibly inventive name for my favourite dark red shades. I find these guys are fab for a festive night out as they have a certain sultry depth that the brighter shades lack. The three I tend to wear the most are (from left to right) MUA's Shade 1, NYX Butter Gloss in Red Velvet and Rimmel's Apocolips in Burning Lava. 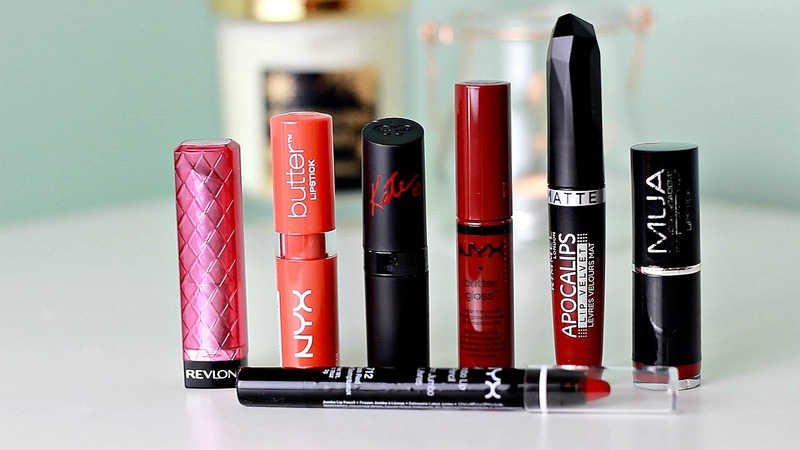 The staying power of all of these is pretty good, especially the Apocalips gloss/ lipstick hybrid. Although I do find it bleeds out quite a bit on dryer lips so be sure to use a good lip liner and lip salve pre application. 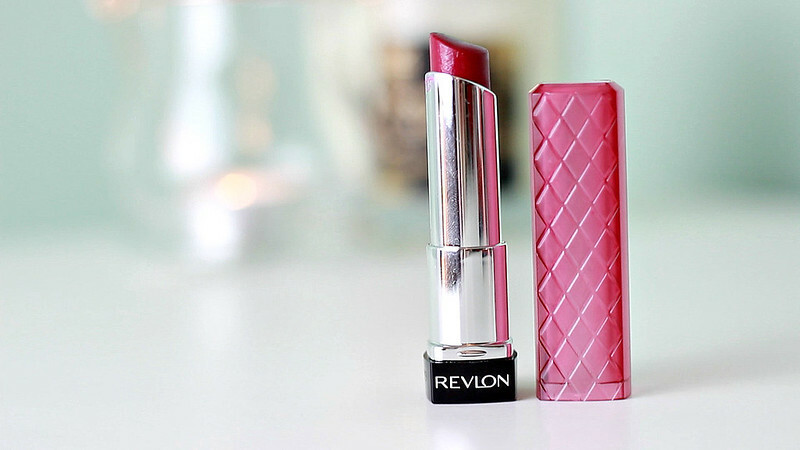 Next we have another dark lip staple for me in the Revlon Lip Butter lipstick in Raspberry Pie. I've separated this one from the other dark shades mainly because it's a little lighter and less "stain" like and also because it's kind of a plum shade. It's the perfect dark lipstick if you're not used to wearing darker shades and want a product to help ease you in. 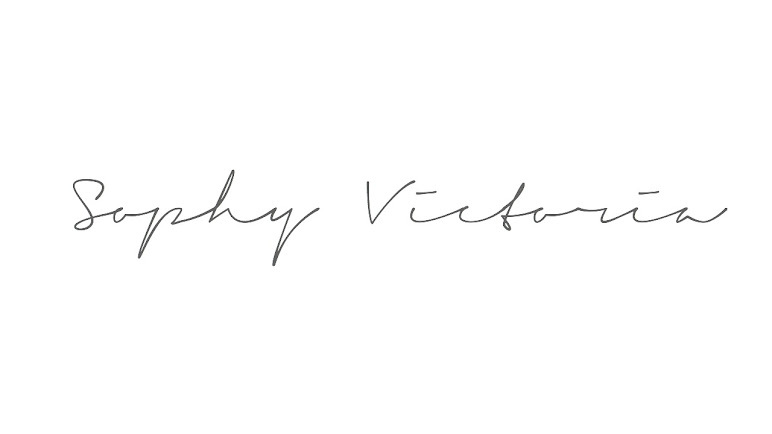 The formula is really easy to work with too; smooth, shiny and creamy. The next lipstick is a really classic shade and probably my favourite formula of them all. 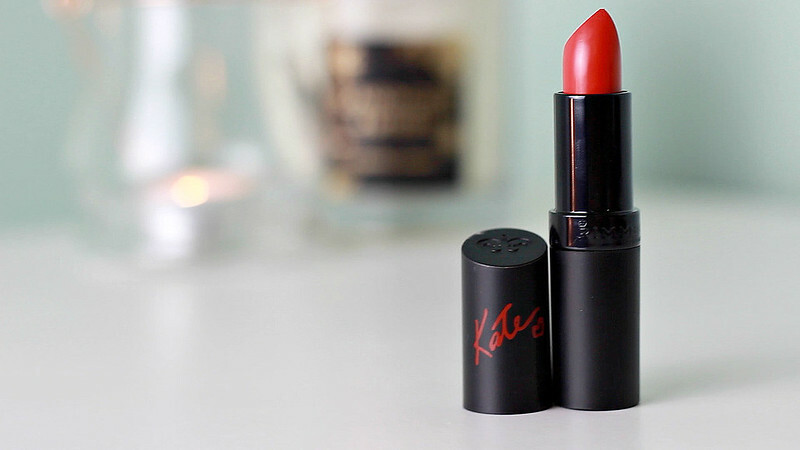 Kate Moss for Rimmel lipsticks are so easy to wear and I find they hardly bleed out at all. This shade is 037 and is a proper pillar box red. Perfect for this time of year! 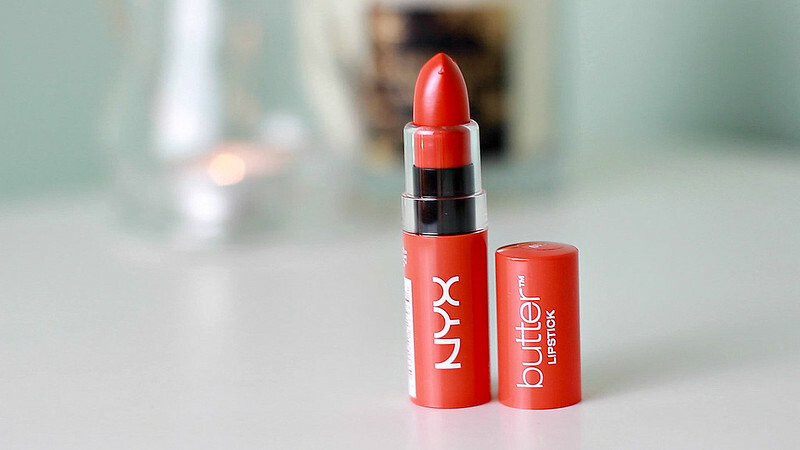 The final two lipsticks are both from NYX, first up we have their Butter Lipstick in Hot Tamale. This is a really orange toned red so for those of you who aren't a fan of the bluer tones, this one is for you. The formula is very creamy and light which I love; a little bit like the Revlon Lip Butters. Again this would be the perfect lipstick for those of you who aren't used to wearing brighter reds and want an easy formula to get to grips with. Last up we have the NYX Jumbo Lip Pencil is Plush Red. This is another plum shade really with a bit more of a red kick than the Revlon. 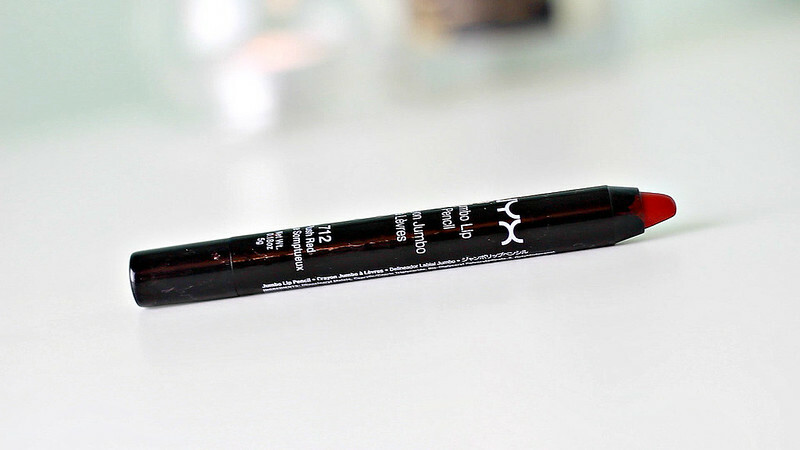 The formula is very creamy at first but it does set a bit after application. Packaging wise this is a great "chuck it in your bag" kind of product as it's slim and pretty inconspicuous... Which is the reason I have about 15 lipstick pencils in my bag at any one time! Do you have a favourite Christmas lipstick? Or have you tried any of my favourites? If so let me know!